You now have the ability to assign different options per user, domain, group, mailing list, etc. This allows you to have pre-configured limits when creating any of the mentioned objects in the console. This is especially helpful for customers who charge for different levels of service, whether it be an ISP or hosting company. To create a new template please follow the directions below. 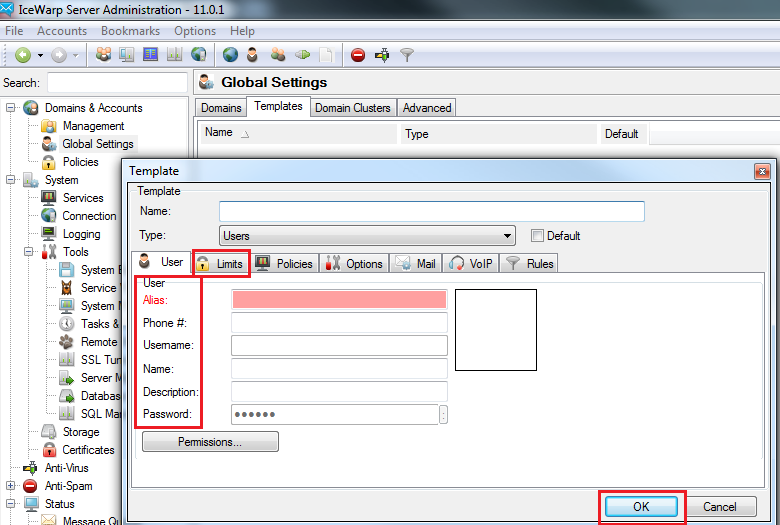 You first need to navigate to the [Main Menu > Domains & Accounts > Global Settings] tab in the administrative console. Now click [Add] to create a template and choose what type of account the template will be created for, in this example it is for user accounts. You can now go through the other tabs to configure the template for any limits, or options you want the template to have. You can choose for the template to be the default used when any user is created. This will allow you to create users without defining a template each time and all settings from the default template will be applied. Once the template is created you can now create a user and you will see the template drop down. This will allow you to choose from any created template for users. Once you choose the template all settings and options configured in the template will be applied to the new account. If you have a text file or CSV file loaded with user accounts from another system and you want to import this into Icewarp and have a template applied you would need to use the TOOL.exe located in the /Icewarp directory. The TOOL.exe is a command line client that uses direct API manipulation in order to perform actions on the server. 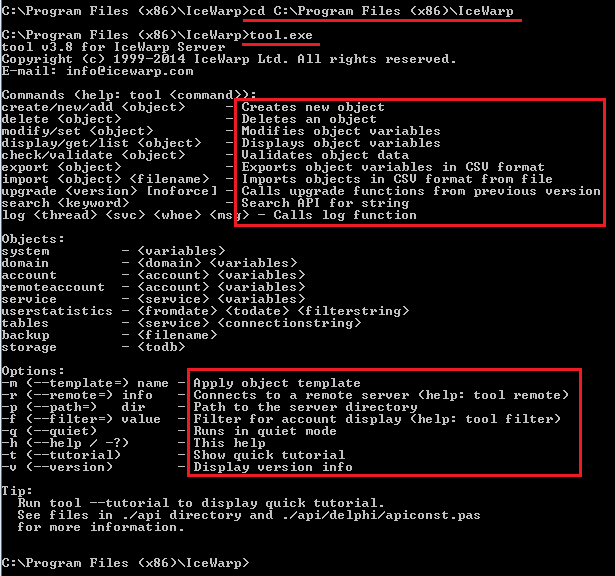 In order to use the tool you need to open the CMD prompt in Windows and navigate to the /Icewarp folder. Once there you can run any tool command. To do a mass import of users and have a template other than the default applied please the command below. tool --template=name of template (if more than one word please use " before the first word and after the last word, so "icewarpdemo") import account "users.csv"
This will import all of the users in the file and apply the template of your choice.